The literature of recent decades has opened up new perspectives for poetics. Writing has spontaneously moved in unison with cultural transformations in the direction of increasing multimediality, digitalization, and virtualization. Barrett Watten, in an important article written several years ago, described the way the field of poetics is expanding to encompass new dimensions in works of e-literature. But beside the newest types of electronic literary works, we have also seen a renewal of forms of spoken poetry; new genres are developing on the Internet, the creators of video games frequently speak of their works’ affinities with literature, and it is even possible to encounter such views as that of Sandy Baldwin, that everything written online presents a chance to recreate what literature is. Poetics undoubtedly bears witness to and engages with this literary revolution in new media. And as in every literary upheaval, this new literature draws, with a greater or lesser degree of transparency, on a knowledge of previous literature, but simultaneously poses questions to its predecessor that otherwise would never have arisen. In point of fact, both literary worlds, that of more traditional media and that of new media, often coexist in joyful harmony and learn much from and about each other through these intimate relationships. Knowledge about the poetics of works in traditional media (including those produced in the contemporary era) functions in this case in constant confrontation with knowledge about the poetics of works that participate in new media contexts. By the same token, the most important contemporary task of poetics is mediation between the two spheres. Poetics has become a medium that brings together, in dialogue, literature from different media and types of knowledge about literature that intersect across those media. 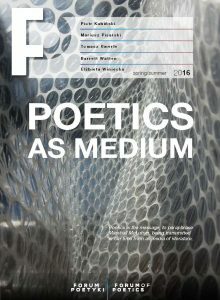 The authors of the articles in this issue of Forum of Poetics attempt to describe the extraordinarily fascinating and wide range of contemporary poetics as a medium. Mariusz Pisarski relates the process by which today’s poetics have managed, with relative quickness and ease, to assimilate hypertext works, and reveals the more difficult tasks and more uncomfortable questions posed to poetics by recent works of e-literature understood as programming processes. Poetics here become interwoven in an astonishingly compelling fashion with the world of video games, allowing for the unexpected fruition of the metaphor of interactivity; alongside the well-known phenomenon of audience immersion, Piotr Kubiński observes its opposite – emersion, and Tomasz Z. Majkowski notes the expansion of narratology’s field of study. For the study of genres, the criteria by which original literary genres are established become a new cognitive puzzle, particularly since some of them postulate the study of historical themes in a new media context and use conventions of older literary forms in the process (Barbara Kulesza-Gulczyńska). Some genres of internet literature have, despite their young age, developed so extensively that their analysis already constitutes a separate branch of poetological study, as demonstrated here by the case of fan fiction (Tomasz Umerle). 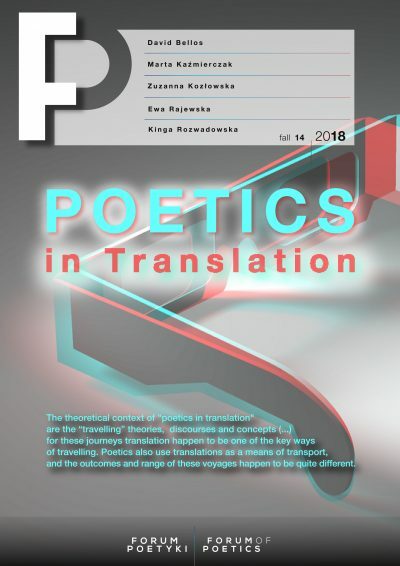 At the same time, there is a heightened need for a revival of oral poetry, reminiscent of the former dominance of the vocal medium in poetic expression; poetry is now often presented as a kind of performance, where orality and theatricality are joined with a poetry that observes hitherto unknown rules (Aleksandra Szymił). This leads unavoidably, as I mentioned earlier, to a revised reading of literature published in traditional book or poem form, as an interpretation of Eugeniusz Tkaczyszyn-Dycki’s poetry as a form of new media literature shows (Maja Staśko). It therefore is not surprising that there is a need to discuss the relevance of Edward Balcerzan’s proposal for a multimedia theory of genres, as it has more to say with each passing year (Dariusz Pawelec). The approach to teaching poetics at universities is also undergoing changes (Wiktoria Tuńska). Sandy Baldwin, with his fervently discussed concept of the literariness of the entire Internet, arrives at the most radical conclusions regarding the transformations referred to above (Elżbieta Winiecka, Tomasz Mizerkiewicz). Observing the flow of poetological knowledge among different spheres of literary and paraliterary creation, varying wildly in terms of the media they use, leads us to define the new condition of poetics as that of a medium. Poetics is the message, to paraphrase Marshall McLuhan, being transmitted in our time from all media of literature.